The 14 & U Intermediate Liberty Tiger Sharks placed second at the National Championships held in Cayce, South Carolina in October. The team consisted of Evan Sood, Caroline Norton, Margaret Goldberg, Jack Harris, Jared Kehn, Olivia Reyes and Coach Paul Ripley. In addition Evan Sood captured one of two Sportsmanship awards given at the tournament. Competing against teams from all seventeen Sections, the Liberty Tiger Sharks made it to the finals where they lost to the three time repeat champion team from Georgia (Southern Section). 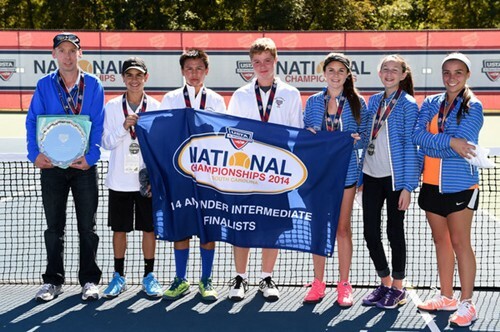 USTA Junior Team Tennis brings kids together in teams to play singles, doubles and mixed doubles against other teams. It promotes social skills and important values by fostering a spirit of cooperation and unity, as well as individual self-growth. Also, it’s a fun environment for kids in which they learn that succeeding is really more about how they play the game – win or lose. Southeast Michigan continues to boast the largest Junior Team Tennis program in the Midwest Section .